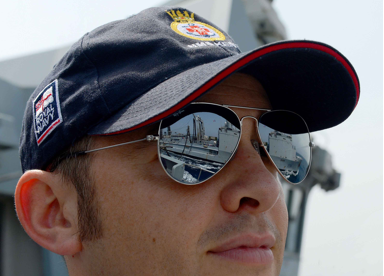 HMS KENT continues her broad ranging maritime duties, conducting Counter Piracy, Counter Terrorism patrols and curbing illegal activity from within the Arabian Gulf to the Red Sea. 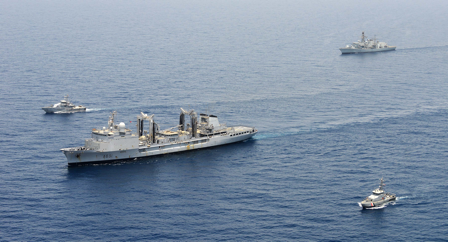 The ship has now joined the international Combined Task Force 150 (CTF 150), already consisting of French and Canadian warships, working with ships from Djibouti, Yemen and Saudi Arabia. Together this flotilla has established a task group to provide assurance for the safe passage of merchant vessels of any nationality through the infamous Bab Al Mendab (BAM) strait and beyond. CTF 150 is pictured in formation as it approached the eastern point of the Internationally Recognised Transit Corridor (IRTC), effectively a protected motorway of the sea for all legitimate mariners. The CTF was later joined by a warship from the Australian Navy, highlighting the importance of this stretch of water to the global economy. By delivering the ‘policing’ of the IRTC the CTF is something of a Counter piracy/terrorism high seas patrol (a 21st century CHiPs for those who remember the 1980s) with the Canadian warship, HMCS Toronto. It should be noted that this is policing on a gargantuan scale, with the ‘motorway’ covering some 190 thousand square miles, with up to 40 large scale ships passing every hour. That equates to some 40% of all goods and essential materials needed in Europe passing through the area when averaged over the year. Having travelled some 1500 miles in the last few days, Kent was in need of a top up of fuel, kindly provided by FS Somme (pictured). Following a queue at the ‘petrol station’, Kent conducted this Replenishment At Sea (RAS) as dawn approached and the air temperature rose to a blistering 40°C. HMS Kent, together with her counterparts will continue her duties for some months to come, in all weathers and sea conditions, day and night, protecting the nation’s interests worldwide.